The accommodation is ideal for a holiday in Britain: 350 m from the Sables Blancs beach and thalassotherapy center, which opened in June 2015. It is a lovely terraced house completely renovated in 2014. The decor is neat .The kitchen has a dishwasher, microwave, oven, ceramic hob with, washing machine. Our house has 3 bedrooms, 1 bathroom, 2 toilets, fully equipped kitchen, living room, dining room. The accommodation is equipped with the box SFR (internet + TV). 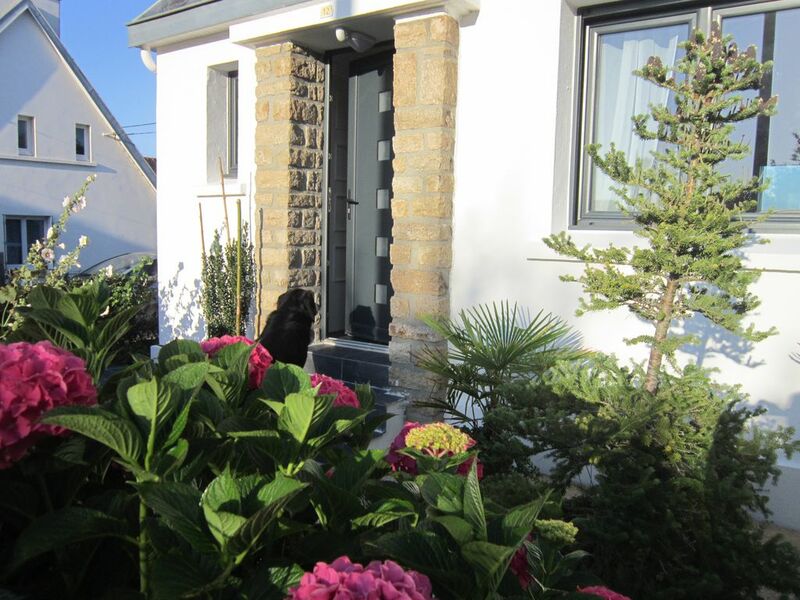 The house is very well located for the old town, the beach and the coastal path. We really enjoyed being able to walk everywhere. An Ideal holiday home for a couple or family with two children. There are 3 bedrooms - the Smallest room is ok for a small child, however we used it to store our luggage. There is a small terrace at the back with a table and garden chairs. The owner was very helpful and friendly. We will be pleased to welcome you again in our home. The house is very comfortable, you will find all necessary things, the kitchen is well equipped, and the house is very clean!!! It is not far from the beach ( about 5 min walk), also there are lots of paths to walk and run. The old city is within 20 min walk. The owners are wonderful people, they are ready to help you at any time. They told us many useful things. Thank you very much for your hospitality !!! Thak you very much Yana and BEST WISHES for 2015 . Happy new year to you , your husband and your two lovely daughters. Ein wunderbares Haus in Concarneau, nah am Strand und ruhig gelegen. Wir würden sehr freundlich empfangen und mit vielen Informationen zur Umgebung und zu Unternehmungen versorgt. Das Haus war gut ausgestattet und sauber, im kleinen Garten konnten wir auch gemütlich frühstücken. Wir hatten eine tolle Zeit in der Bretagne. Das kleine Haus ist sehr liebevoll eingerichtet, mit neuem Bad und moderner Küche. Die Ausgangslage ist zentral: in 20 Minuten zu Fuß in die Altstadt, mit dem Fahrrad in 5 Minuten. Wir haben viele Ausflüge in die Südwestliche Bretagne unternommen. Die Vermieter haben uns herzlich begrüßt und mit vielen Infomationen versorgt. Wir kommen gerne wieder - herzlichen Dank! Wir waren als Paar in Concarneau. Nous vous remercions de votre venue à Concarneau. Nous vous avons trouvé sympathiques et serions heureux de vous recevoir de nouveau. Sehr angenehm und geschmackvoll. Sehr gute Lage. Wir kommen wieder. A une prochaine fois. Kenavo d'ar wech all. A green path is close to the house, walkway leading to the city center in 20 minutes. The coastal path (G 34 R), 350 m from the house you can walk along the sea for many miles. A center "Thalasso" opened its doors in July 2015. The marinarium and fishing museum will introduce you to a little over the marine environment. The islands' Glénan "are only a stones throw away. Not to mention the Sables Blancs beach where you can indulge in the joys of swimming or diving.